TV listings and start times for Saturday's Elite Eight games featuring Oregon vs. Oklahoma in the West Regional and Kansas vs. Villanova in the South Regional. Eight teams are just one step away from reaching college basketball’s promised land. Only four of them will make it there. The first two teams to punch their tickets to the 2016 Final Four will do so on Saturday. The entire season has been a stirring prelude to this moment. Now it has arrived, kicking off with four teams that have truly been among the nation's elite all season long. This is quite the way to get started, huh? 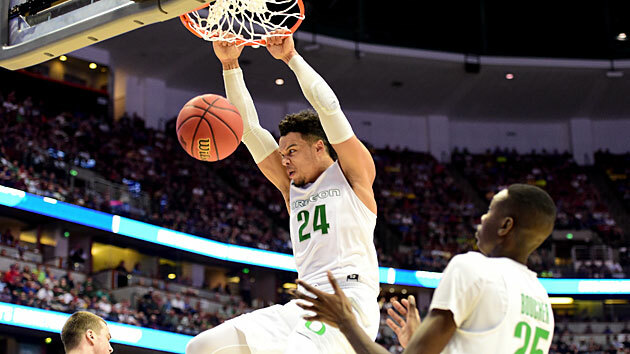 The Ducks and Sooners both cruised into the Elite Eight, with Oregon taking down defending national champion Duke, and Oklahoma blowing past SEC co-regular-season champion Texas A&M. This is going to be billed as a game between two high-powered offenses, and rightly so. The Ducks are 11th in the country in adjusted offensive efficiency, while the Sooners are 14th and feature potential Wooden Award winner Buddy Hield. The senior from the Bahamas is undoubtedly the best individual player remaining in the field, and he alone makes Oklahoma a slight favorite in this game. On the other side, we saw what Dillon Brooks and Elgin Cook could do in Oregon’s dismantling of the Blue Devils on Thursday, as they combined for 38 points and 15-of-27 shooting from the field. They’ll bring that offensive punch to bear in the Elite Eight. As good as these offenses are, the outcome is likely to be decided by which team can get the most stops. Both the Ducks and Sooners held their respective Sweet 16 opponents to 13 points below their season averages. With two teams that average a nearly identical scoring output per game (81.3 for Oklahoma, 80.7 for Oregon), it seems clear that whichever one delivers a similar defensive performance on Saturday will be headed to Houston. Six different teams were ranked No. 1 at some point this season. The Jayhawks and Wildcats were two of them, combining to hold the top spot for the final six weeks of the year. This game features the Big 12 regular season and tournament champion in Kansas against the Big East regular season champ in Villanova. The No. 1 overall seed against a team that was likely just one win away from being on the top line itself. Perry Ellis against Kris Jenkins. Frank Mason against Ryan Arcidiacono. Wayne Selden and Wayne Selden’s uncle. Both of these teams are in the top 10 in both adjusted offensive and defensive efficiency. The only other team that can claim that is Virginia. The Jayhawks are fourth in the country in three-point percentage, while no team is shooting the ball better than the Wildcats in this tournament: 59.9% overall and 53.2% from outside. This game has the feel of a Final Four showdown, but only one team will actually get there.